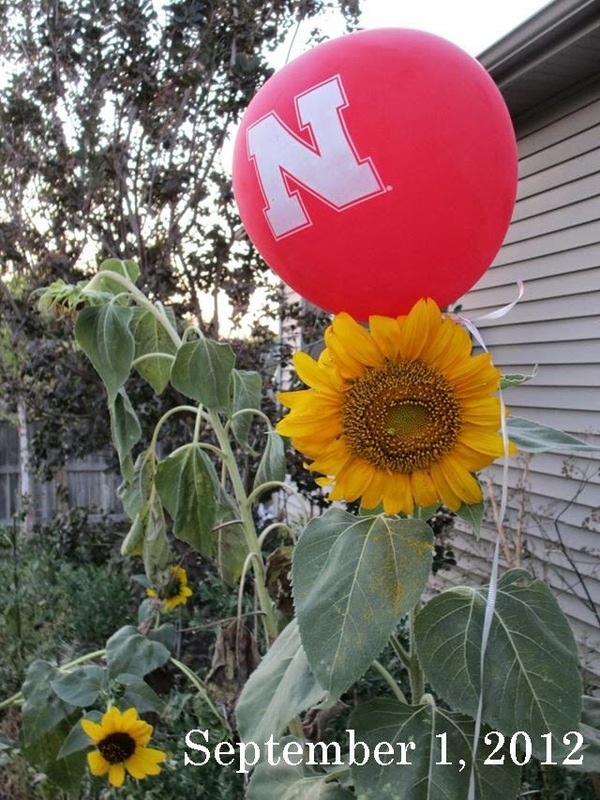 This balloon landed in our garden after the September 1, 2012, Husker game. 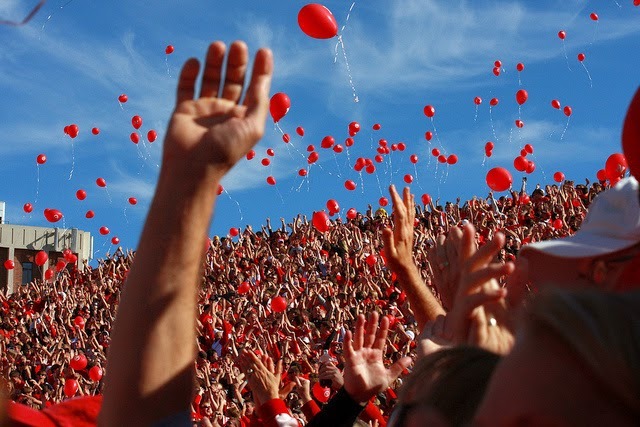 It was part of a final send off, meant to give UNL football fans the opportunity to photograph the 60+ year tradition of releasing 4,000-5,000 helium balloons after the first touchdown of every home game, before the practice was temporary suspended due to a global helium shortage. In my mind, the suspension came as a relief, since balloons do not simply float into the sky and disappear. Instead, they can drift hundreds and even thousands of miles away, polluting our countryside, waterways, and oceans. 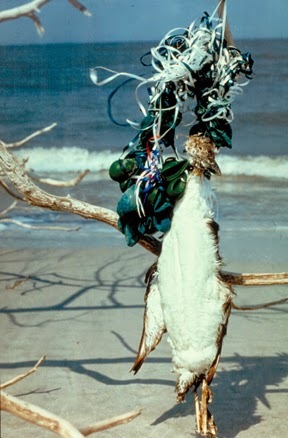 Birds, fish, turtles, and other small animals ingest the debris, resulting in intestinal blockage and death, while others become fatally ensnared in the string. The self-imposed balloon ban at UNL lasted only two weeks, however. By the following home game--and for every home game since--the balloon release was reinstated. 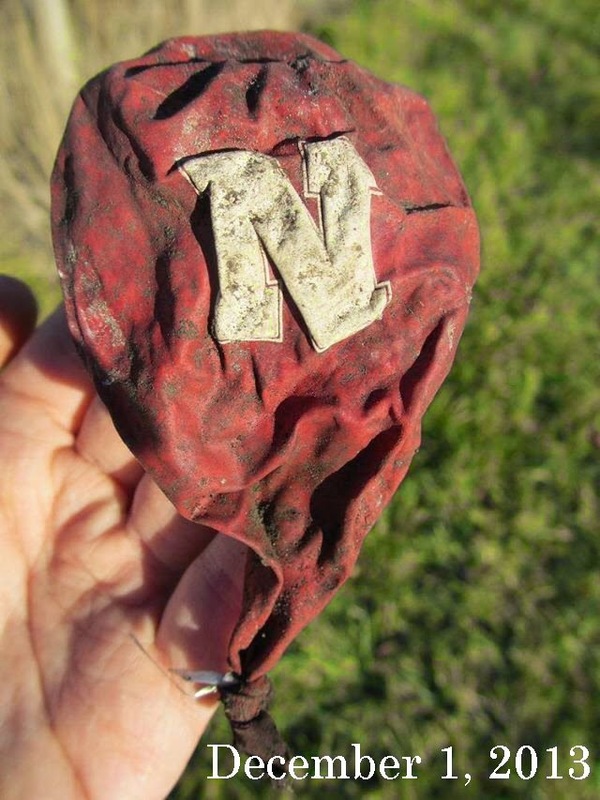 When I contacted the UNL athletic association about environmental concerns related to balloon releases, I was assured via form letter that the balloons are biodegradable, a statement underscored by Chris Anderson, Associate Athletic Director for Community Relations, in a 2011 interview with the Daily Nebraskan. "'Many years ago we switched to biodegradable balloons,' Anderson said. 'That way we can keep the tradition alive without hurting the environment.'" See the full article here. 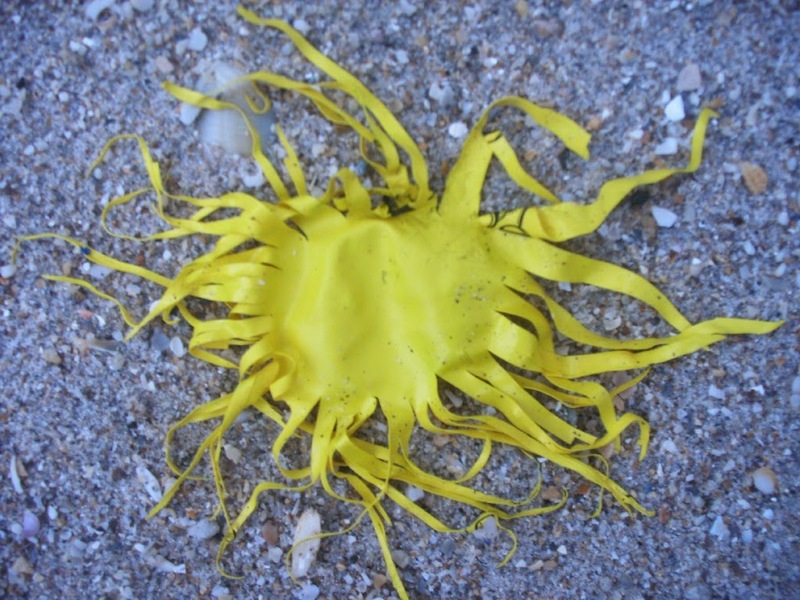 The problem with "biodegradable" balloons is that they take years to decompose, giving wildlife plenty of time to ingest them before they disintegrate. My spouse and I decided to see how long it would take for the Husker balloon that landed in our garden to decompose. In September 2012, Ben buried the balloon in a vegetable bed, under compost and clay soil, where it stayed for 14 months. He dug it up on December 1, 2013, to check on its decomposition status. The balloon was intact, with no holes or fading to the ink. The remnant of the attached ribbon still looked new. He returned the balloon to the ground for another nine months. 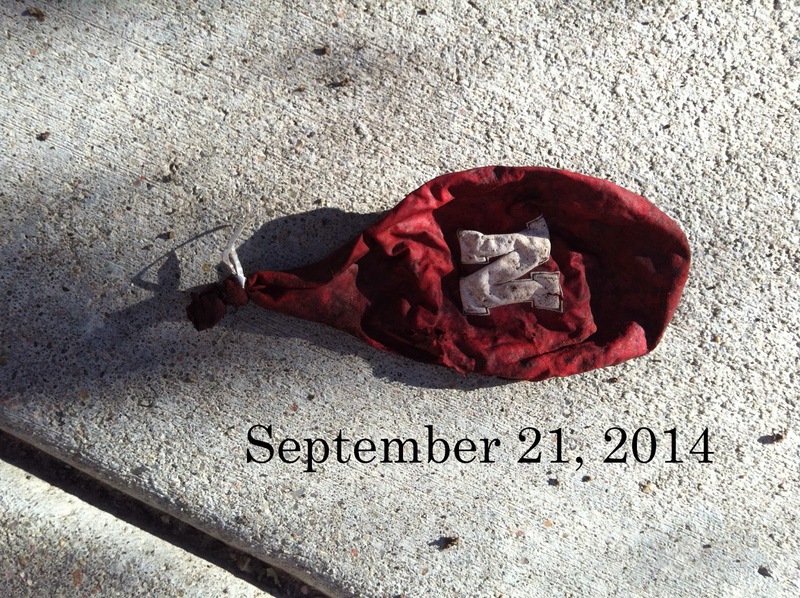 It's now September 21, 2014, and we dug up the balloon again this afternoon. The attached string remains intact, and for the most part, the balloon does, too. The latex does feel more brittle, and the ink is now crackled. But, the balloon has yet to decompose, even after two years. Another claim made about latex balloons--biodegradable or not--is that "when the balloons reach their maximum height of about five miles, the atmospheric pressure causes the balloons to expand and eventually shatter into thousands of tiny little pieces, which makes it nearly impossible for animals to eat" (as described by Matt Havelka, reporting for the Daily Nebraskan in the above referenced article). The reality is that while the balloons may indeed shatter, the pieces are not impossible for animals to eat. 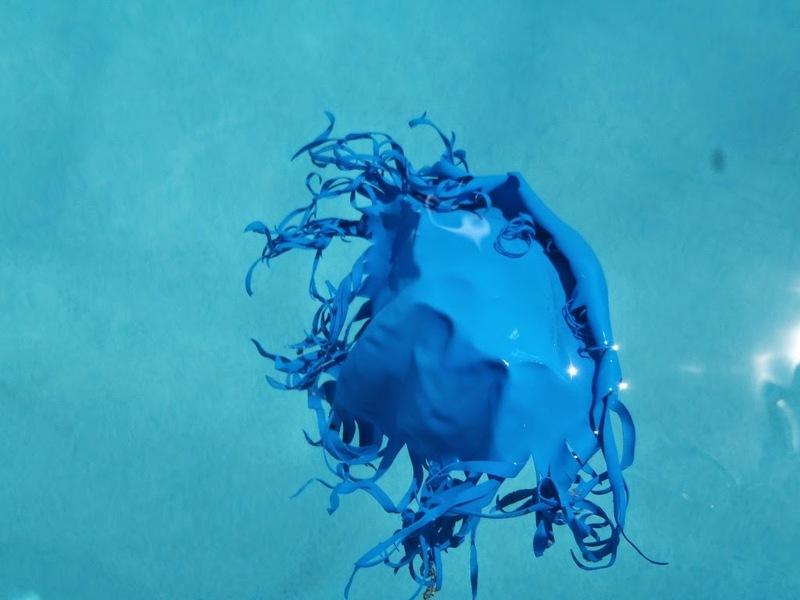 In fact, the fringe of shattered latex balloons mimics the shape of jellyfish, a favorite meal for many ocean animals [in addition, fish, birds, and other kinds of aquatic life also see pieces as food]. Let's create a new tradition to celebrate Husker pride--one that doesn't pollute our streams and fields, harm wildlife, or sully the Nebraska so many of us love and call home. 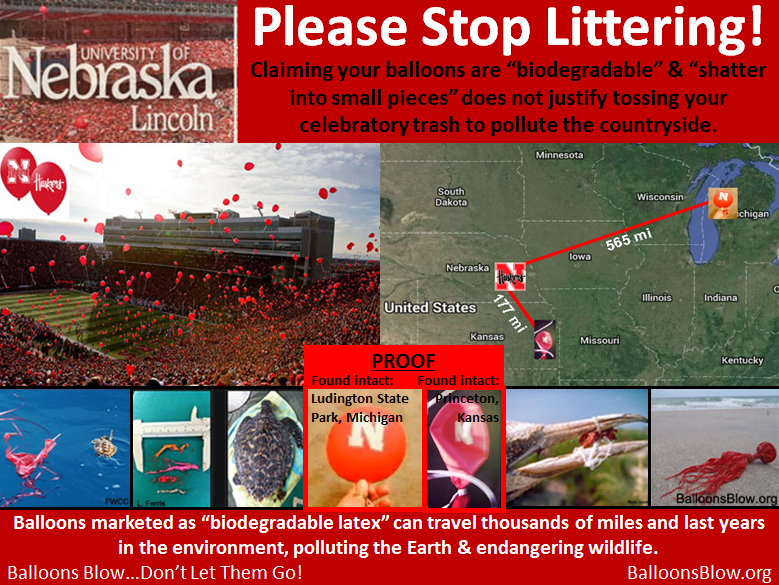 SIGN THE PETITION to encourage UNL to end balloon releases. This weekend my wife and I toured the largest virgin tract of prairie in eastern Nebraska, which is just 15 minutes from our house. Nine Mile Prairie is managed by UNL and owned by the University of Nebraska Foundation (UNL leases it from the foundation for $1 a year). But at just 230 acres it's a small remnant (well, quite large really, but still...). 392 plant species and over 80 bird species have been recorded at Nine Mile, and it's a genetic material seed source for restorations around Nebraska. David Wedin, the director, started off our tour with looking at management practices and concerns. The UNL adventure club has a challenge course on the site, which is near massive high-tension wires on the south side. On the north side are former nuclear bomb bunkers now rented our for storage (Dr. Wedin said there's some very unique plants among those bunkers). The new Lincoln Police Department firing range is also slated to go in to the north in coming years -- won't that be peaceful? One of the things that stuck with me was the failed management of sumac which is taking over an entire 40 acres (and more) -- failed in the sense that fire isn't working, but glyphosate applications on cut stems is. David went on to talk about the increased levels of nitrogen and carbon in the air; nitrogen is coming off of fertilizer applications in ag fields, primarily, and is accelerating grass growth rates. At the same time, increased carbon is favoring C3 plants like woody vegetation -- they've already documented the changes. In fact, they've decided to keep the trees that weren't there 100 years ago while still managing red cedar; the strategy is to manage for diversity as climate change throws more and more curve balls, because there is no going back. Tall grasses are also more prevalent than in the early 1900s, when plants like the much shorter prairie dropseed where in control. We found many forbs in bloom and some were delightful surprises on our separate plant identification hike. 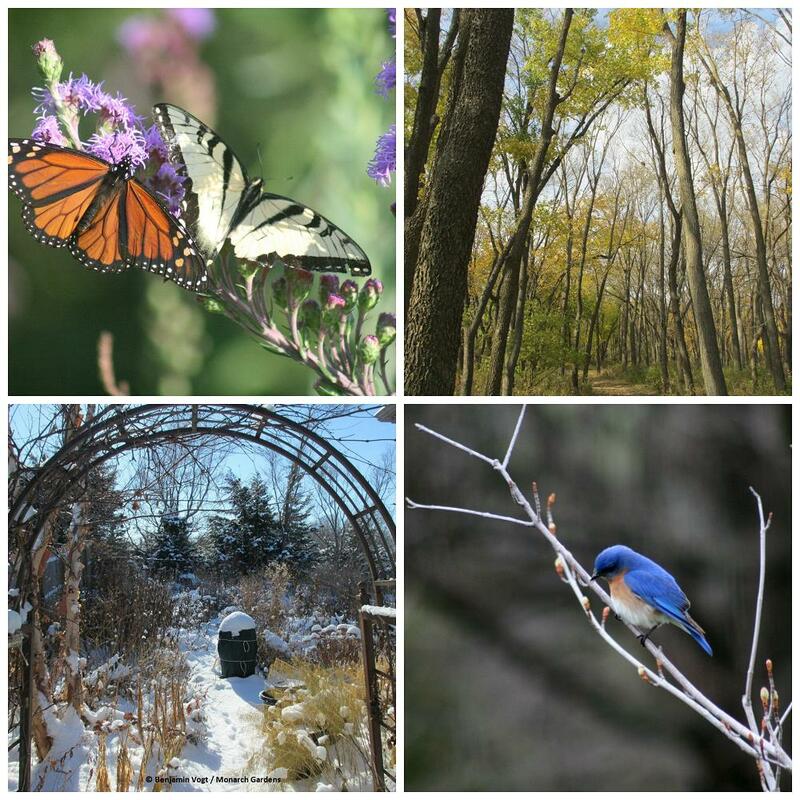 Thanks to the Nebraska Native Plant Society for organizing the field trip! A cold morning gave way to warm sun and wonderful discoveries. For years my wife and I have wanted to remove our front lawn and replace it with a prairie garden that increases water penetration, soil fertility, and helps pollinating insects. We're up against suburban dogma that says lawn is king -- we have neighbors that mow 3x a week, hire TruGreen, trim lawn with scissors, and water every morning with auto sprinklers. But we're burning to make a difference. We want to set a better example and use our space to teach and inspire in as many ways as we can. But of course, we need help to make it happen -- we need you to believe in us, believe in this sort of thing in our neighborhood, city, and across the country. If our project doesn't get fully funded by September 14 it won't happen. Can you help us? Will you spread the word? Here's the link to our Indiegogo campaign. Our strategy is to get the garden in as fast as possible so any "messy" transition or years of slow building won't rile up the neighbors. We have a wide 6' swath of lawn we'll keep as a pathway through the 600' garden. 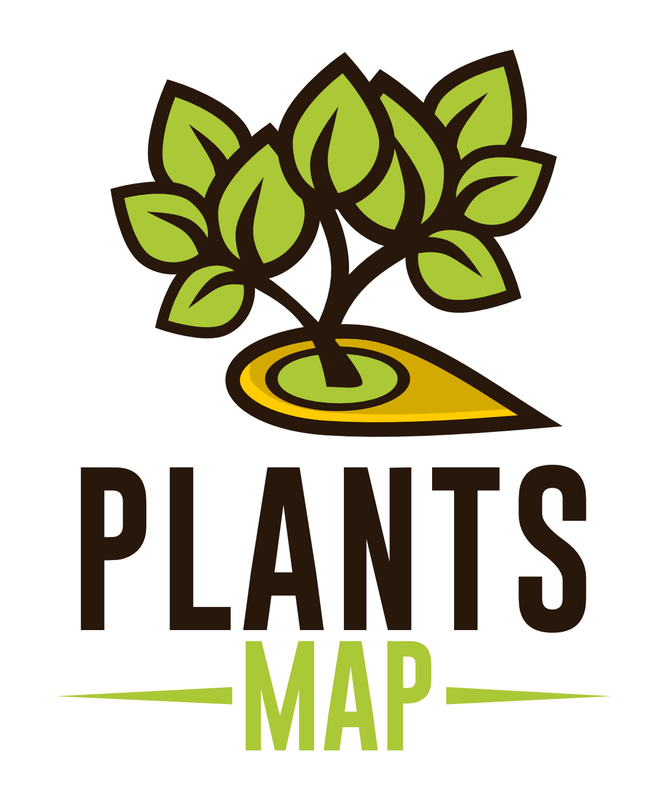 We'll use plants that get less than 3-4' tall, and plants nearest the driveway, curb, and property line, will be 1-2' tall at most. 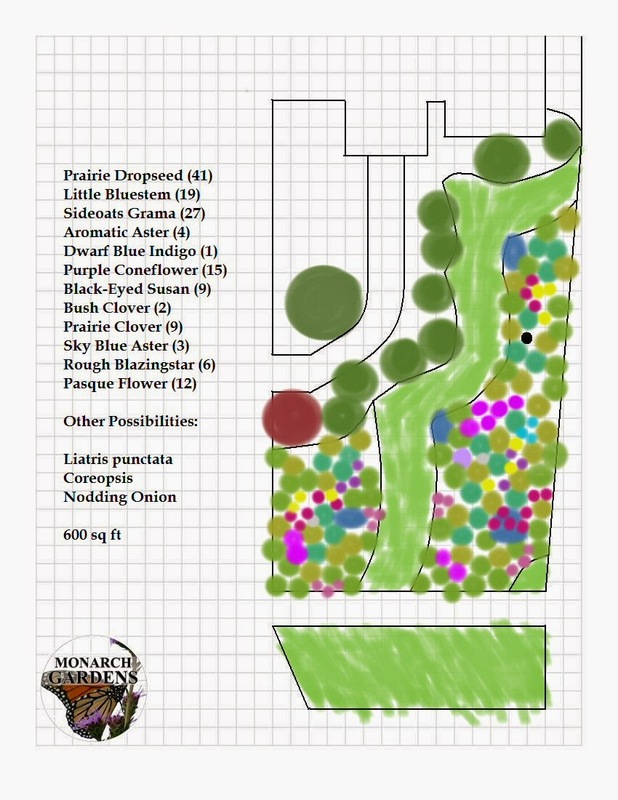 I'll source my plugs from a local nonprofit prairie nursery who uses many local genotype seeds. 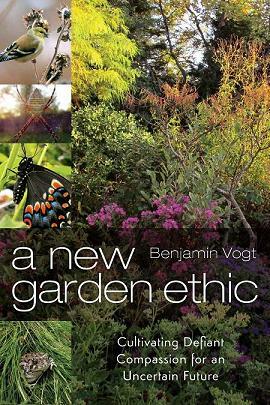 There will be a sign saying what the garden is, why it is, and what it's doing for water, soil, and wildlife. We're ready! Can you feel it?